Round up of the players eligible to represent the Nigeria National Teams that found the net for their respective teams in matches in the Football League on Saturday, November 24. In a League One tie at The Valley in London, Charlton Athletic made it three league wins in a row after seeing off Bristol Rovers 3-1 with Joe Aribo among the scorers for The Addicks. Charlton were in front on the stroke of half-time when Aribo headed home from six yards out with Nicholas Ajose playing a part in the goal when his cross was nodded back into the danger area. 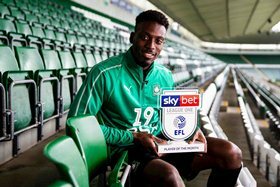 At Home Park (Plymouth), former Flying Eagles invitee Freddie Ladapo continued his blistering form by scoring a brace as Plymouth Argyle returned to winning ways with a 2-1 victory over Fleetwood Town. Ladapo beat goalkeeper Cairns from eight yards out to open the scoring in the 72nd minute, then headed home a second from a corner with nine minutes left. The 25-year-old has averaged a goal per game in his last eight matches in the division. Fejiri Okenabirhie closed the scoring but his goal was not enough as Shrewsbury Town lost 3-2 to Fred Onyedinma's Wycombe Wanderers. The former Nigeria Football Federation target slotted a low shot past Stockdale in the 73rd minute to give Shrewsbury Town hope but the home team held on to secure three points. Finally, Fulham loanee Elijah Adebayo scored for the fifth time this season to help Swindon Town beat Port Vale 1-0 in a League Two clash at Vale Park. The tall striker tapped into an open net in the 11th minute after the ball was parried by the keeper.